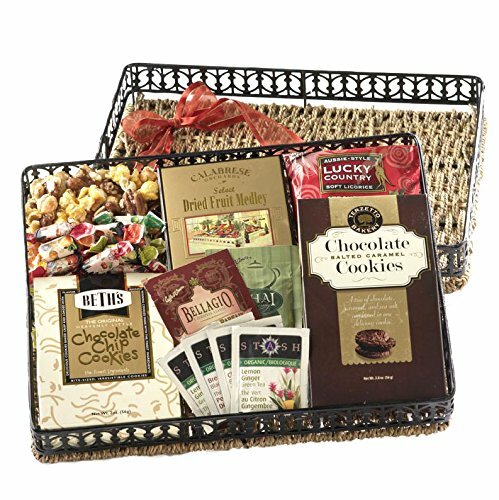 Gourmet collection of heavenly little chocolate chip shortbread cookies, chocolate salted caramel cookies,strawberry licorice, Assorted Toffees, select dried fruit medley, almond-pecan popcorn, and an assortment of teas and hot cocoas to enjoy! Magnificent seagrass tray is hand woven, and finished off with an elaborate faux wrought-iron trimming. A lasting gift once the treats are enjoyed! GIFT TRAY DIMENSIONS: 14" x 11"